Home » Australia » Australian Residents and Australian Citizens – How they are NOT the Same! However similar ‘Australian PR’ and ‘Australian Citizenship’ sound, there are some dissimilarity between the two. Here are some of them. An Australian citizen has all the benefits and responsibilities that a citizen of a country would. Citizens can have an Australian Passport and when they travel to other countries, they are entitled to get help in that particular country from an allocated Australian Consul. Australian citizens cannot be deported, and they can leave and come back to Australia without any hassle during immigration processes. Australian citizens have the right to vote. Children of Australian citizens, who are born in a foreign country, can become Australian citizens by descent. Citizens can be a part of Australia’s defense forces and public sectors. An Australian resident has quite a lot of restrictions and rules to follow. A resident cannot stay in Australia for a really long time. Minimum of three years out of five is the limit for a resident to stay in Australia. To stay longer, a special visa is required. . A resident in Australia can be deported and they have no right to vote. He or she can avail insurance and is eligible to buy a property in Australia. Resident return visa is a must for an Australian resident to travel in and out of the country. Residents cannot work in defense forces and public sectors. An Australian resident can be deported from the country at any point of time. 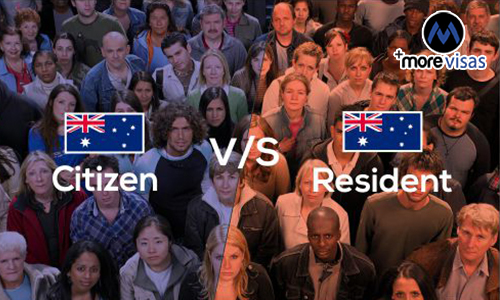 These are the basic differences between Australian Citizenship and an Australian PR.